Home / Archive by category "English informations"
Also, there is a tropical tank, which was built in 2013, and it shows a coral reef habitat with sea anemones, clown fish, surgeon fish and many others. 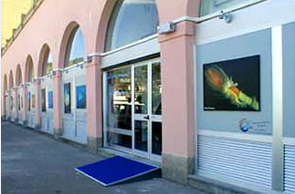 The Accademia Mare Ambiente (A.M.A.) is a non-profit association, which runs the aquarium and the Centro Didattico di Biologia Marina (Educational Centre on Marine Biology). A.M.A.’s members, most of them volunteers, carry out educational activities for students, such as guided tours of the aquarium and laboratory activity on marine biology. They have an active role in Cetacean Rescue and Scientific Research.